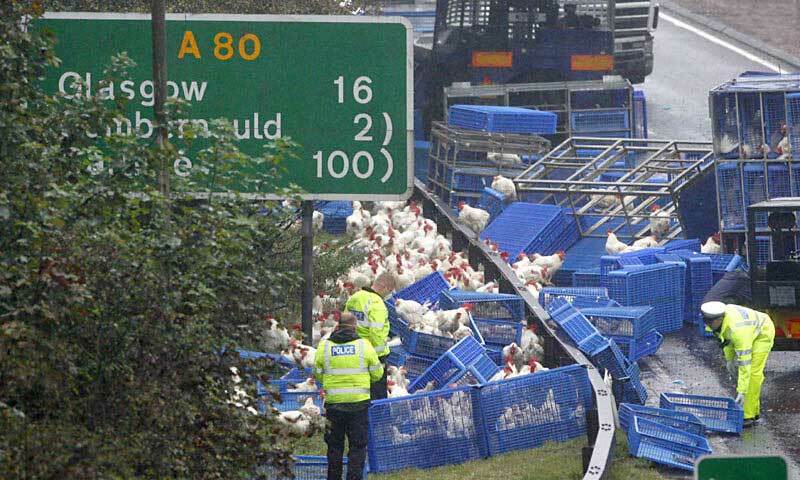 On October 12, 2007, 3,000 chickens were being transported on the A-80, one of Scotland’s busiest roads. 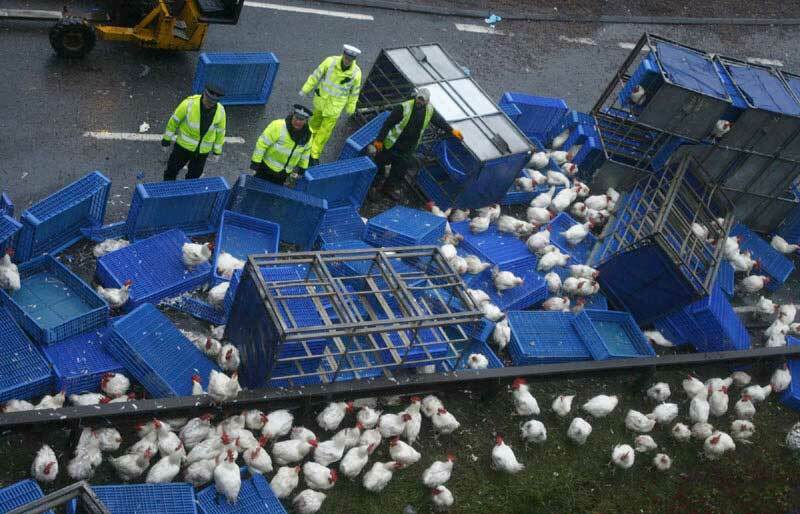 The lorry jack-knifed near Castlecary, spilling chickens everywhere. The driver was treated for back injuries. 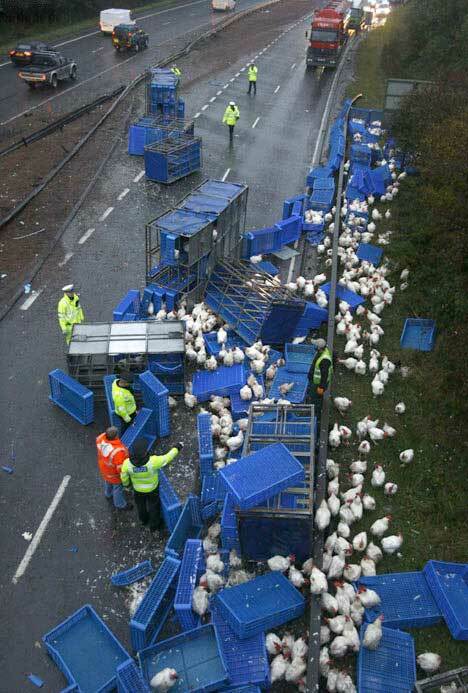 400 chickens died in the accident, or later from their injuries. Traffic backed-up for five miles and the A-80 was closed for hours. Thousands of chickens escaped from their crates and flocked on the road and nearby. 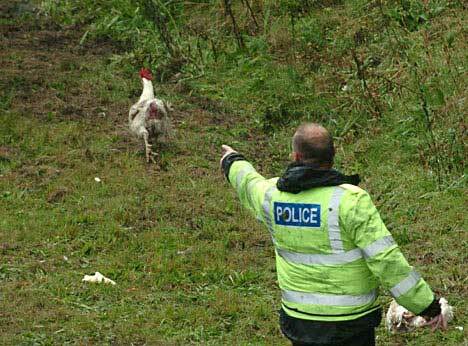 Police spent five hours trying to catch the birds. Officers also took down the license numbers of drivers that were using their cell phones to take photos of them as they chased the chickens. They reported that 20 drivers will be charged with using a cell phone while driving. Chicken Handlers from Noble Foods and Veterinarians arrived to help. One Vet estimated that she had to put down about 80 chickens with broken wings and legs. The survivors were eventually put back in their crates and taken to a processing plant where they were slaughtered as planned. Not a good day for the chickens.